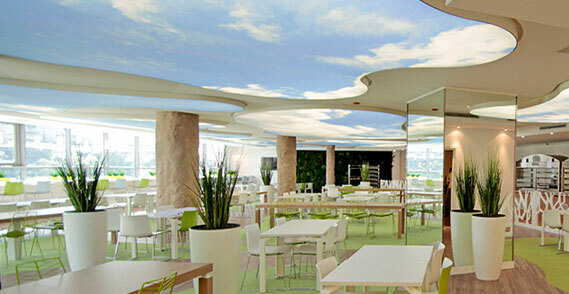 Clipso Stretch Ceilings can be installed in a new building as well as interiors under renovation.Decorative translucent ceilings provides additional lighting effects for commercial application. Before installing clipso stretch ceilings in a new building, all dust and debris in rooms should be removed to ensure the entire space is clean and dry. Stretch Ceilings for interior renovation, the furniture, etc. must be covered during the process of installation. Relocation of lighting fixtures and other stretch ceiling fittings is impossible once installed, without replacing the NAKSHATRA CLIPSO Fabric. Consequently, confirming the positions of the stretch ceilings before installation is imperative. Stretch Ceilings are artificial. Always protect fabric from sharp pointed objects and tools. Installing or Uninstalling a Stretch Ceiling requires a professional! Do not try to remove sheet with improper tool or by unauthorized person. Stretch Ceilings are very sensitive in nature. Do not use brush for cleaning the Fabric. Use only soft cloth.